July 4th E-Mail – Maine. Ocean. Camping. Last night we sent this e-mail out to the guests we’re expecting to arrive before the 4th. Just in case we didn’t have your e-mail, or if you’d like to join us, I thought it would be a good idea to post it here. Early Saturday afternoon Bob will start gathering the seaweed and salt water from the beach and the boys will get the fire going so that there’s a hot bed of coals ready to start cooking on just before you head to the picnic tables. While they’re doing that, Astrig gets the bread dough started and checks the garden to see what we can use for fresh garnish on the Foccacia. About 45 minutes before dinner Steven and Jim pile the seaweed onto the hot steel plates and add buckets of local steamers & mussels, the freshest lobsters, corn on the cob and mixed bags of sweet onions and potatoes. While all of this is going on, Becky sets the tables, melts the butter and mixes the strawberry lemonade and Astrig puts dessert together. There’s always locally made Gifford’s ice cream to top the desserts which can be peach blueberry Dutch cobbler, pineapple upside down cake, mixed fruit crumble or something deliciously chocolaty…we want to surprise you. Your only job is to reserve your tickets in advance (we only cook for 40 people), arrive on time and bring a bottle or two of your favorite beverage…we’ll do the rest. And if you’re not a lobster fan, you can order a hand-carved, grilled steak or all beef hotdogs. Dinner is $42/person for lobster or steak (tell us when you order the tickets) or $16 for hotdogs. Although we always love to be surrounded by friends old and new, we can only accommodate those folks holding tickets at the Lobster Tent because most of the meal is served family style. 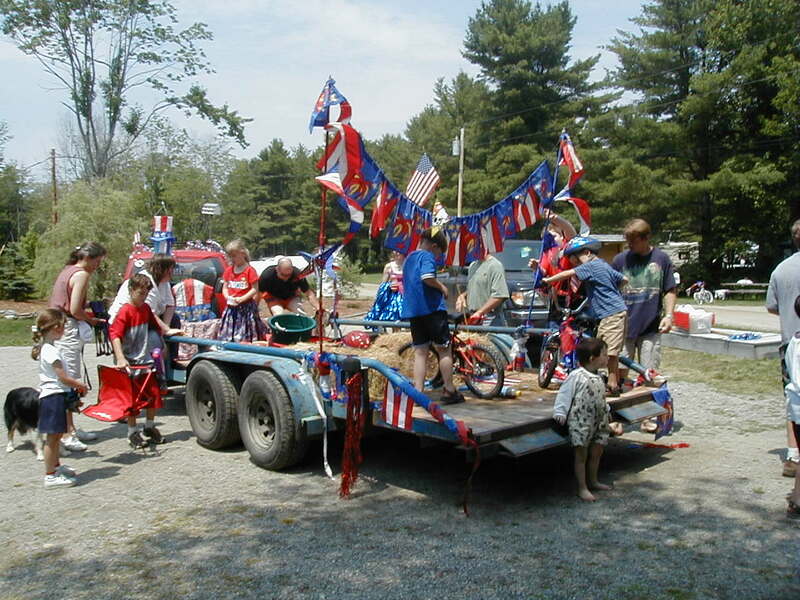 The family float party will be on Friday morning and the kids can either ride on the float or ride their decorated bicycles in the Searsport town parade, slated to begin at 1 PM. Immediately after the parade the Searsport Firemen will host a children’s muster and everyone is invited to join. If you’ve got extra streamers or July 4th decorations, please bring them along so that ours will be the most festive float in the parade…Bob and Jim are bringing DJ equipment and bubble machine so we know we’ll have the most fun! 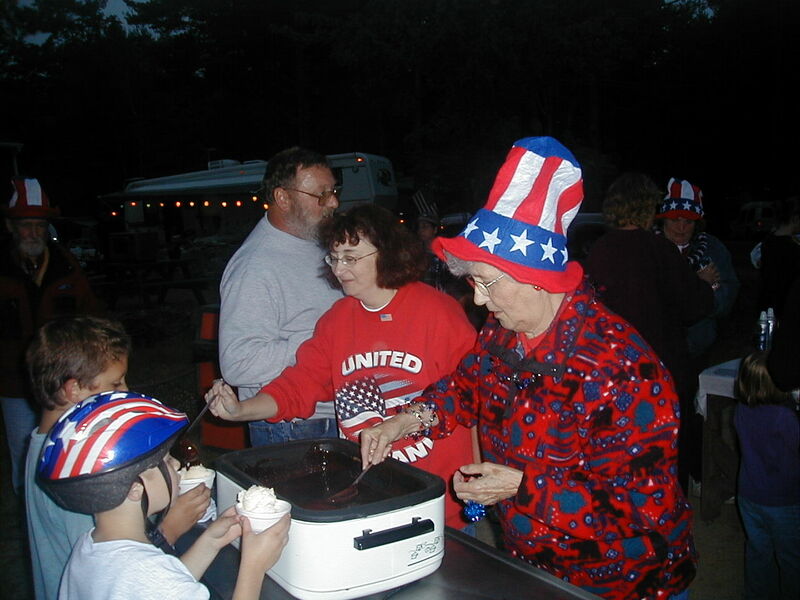 Fireworks will be launched from Searsport’s Moseman Park at 9:00PM. It’s a 2 mile walk/drive from the campground or you can walk to the water’s edge at the beach and see many of the sparkles right from here. Here at the campground, we’ll have Free Monster Hot Fudge Sundaes on Thursday the 3rd with a dance and light show to follow from 7 to 9PM. Friday’s the parade and evening bonfire on the beach, Saturday’s the lobsterbake and Sunday we’ll have flashlight games when the lightening bugs come out to play.